Mine would be something like this: I was faced with the challenge of writing a crime novel to a tight deadline. I had a great plot for the murder of a championship snowboarder killed by a malevolent fir tree, then reminded myself that my books are set in Cambridgeshire where there is rarely snow and everything’s pretty flat. In a panic I considered relocating to Switzerland but then I saw the slightly scary but very motivational photo of my agent staring down at me from the shelf above my desk. I finished the book in record time and grabbed a bottle of wine and some glasses to celebrate. For me this is not dissimilar to the way a book starts out. My ‘dice’ consist of thoughts, observations and ideas that I have collected. They are frequently completely unrelated. I jot them down on separate pieces of paper and lay them out in front of me, moving them around until a sequence, a character or even an entire plot begins to emerge. By the time the book is complete some of the ideas may have been scrapped and others would have evolved beyond recognition. My first dice – an anecdote. A friend of a friend had taken out a restraining order against her violent ex-partner three months earlier, only to discover that he’d been camped in her loft the entire time. What kind of person would behave like that? What were his thoughts? His motivations? Ultimately the scene became incidental to the main plot but led me to the character of Kyle, a former soldier who is struggling – and failing – to straighten out his life. Kyle and his family were hugely enjoyable subjects to write about. Kyle and his younger sister Leah grew up with their mother, Julie, who has been mostly alone since the death of their father. Kyle, his girlfriend Hannah and their baby Harry live close to his mother’s house. Julie isn’t the most maternal of women but the family unit is closer than it first appears and this is largely down to Leah. Their interdependencies, weaknesses and, ultimately, their determination to prevail are at the heart of the book. My second dice – lock-up garages. When I was about eleven I fell in love with what is still my favourite model of car, a MkII s Zodiac. I became rather car obsessed for a while and liked to try to spot hidden gems in people’s garages. Of course I tended to do so when the door was opened … but what about the ones that never were? The ones where the locks had rusted and weeds grew undisturbed? Many times I’ve imagined what might lie behind these and I just don’t always picture classic cars any more. I reckon that everyone in the country lives near a lock-up like that, whether it’s at the end of a neighbour’s garden or in a row where no one is sure which garage belongs to which house. I liked the idea of taking something that is nondescript and an everyday sight and giving it a more sinister image. My third dice – kill a regular character. My detective, DC Gary Goodhew, survived a near death experience but was seriously injured at the end of The Backs. This resulted in him questioning whether to return to work and it wasn’t just a case of feeling physically fit enough but dealing with feelings of guilt over the death of a colleague. The impetus to return comes with the murder of Ratty, a character who has made cameo appearances at several points since the first Goodhew book. How would he die? And why? And what back story would the readerfinally discover about this shadowy and often antisocial homeless man? Killing a character who has had a role in a series (even a minor one) raises the stakes and I was determined to give him a memorable, if slightly grim, final scene. 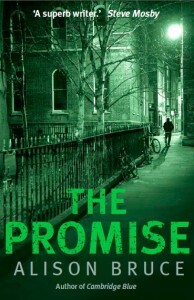 The Promise, Published February 4, 2016 Hbk Constable. Buy it Here.